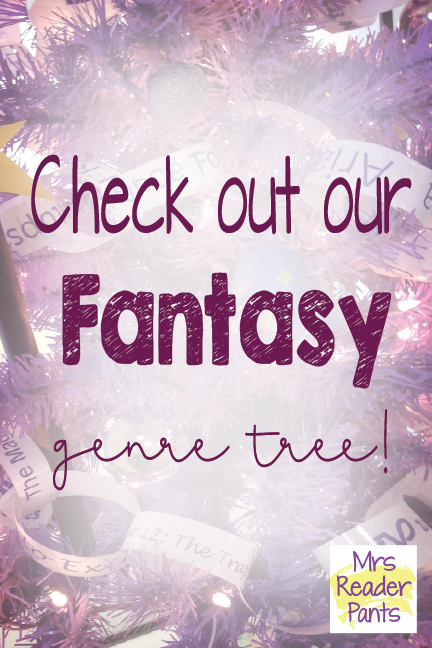 Mrs. ReaderPants: Check out our newest Genre Tree! Check out our newest Genre Tree! Introducing the Fantasy Genre Tree! Each year just before Thanksgiving Break, I set up our genre trees. I have added a new tree each year since we genre-fied in 2011. This year's tree is purple to represent our High Fantasy section. So pretty! The top of the tree is adorned with a large purple dragon foot from my son's Skylanders Halloween costume. Each of the paper chain links has a title from a book in our High Fantasy genre section, all in different purple fonts. The ornaments include a homemade wand and two homemade wizard caps. I am planning to dig in my kids' toybox this weekend to see if I can find some other fantasy-related ornaments. The presents under the tree are books from the High Fantasy genre section. Our other two genre trees are the Romance/Chick Lit tree (pink) and the Realistic Fiction tree (blue)--Click this link for detailed photos of the pink and blue trees. All three trees are up and decorated in the library (we introduce a new one each year, but all of them are up at the same time). The colors for all trees reflect the color-coded label on the books in their respective genre sections.